Biography of Pele is very rich in many ways. He is widely regarded as one of the best soccer players in the the history of soccer. Pele was born on October 21st 1940 in Tres Coracoes , Minas Gerais, Brazil to a father João Ramos do Nascimento also known as Dondinho in his soccer playing days with Brazilian side Fluminense and mother Dona Celeste Arantes. Pele's full name is Edison Arantes do Nascimento and he was named after the American inventor Thomas Edison, however his parents decided to remove the I and name him Edson. His birth certificate has Edison on it although everyone called him Edson growing up. Pele biography shows that during his childhood he was nicknamed Dico by his family. Pele biography shows that it was during Pele's school days when he got the nickname "Pele" because he had a hard time pronouncing his favorite local soccer player's name, goalkeeper Vasco da Gama that was nicknamed "Bile". After some time, his mispronunciation of Bile earned him a nickname Pele that would be recognized around the world later on. Biography of Pele shows that he grew up in poverty and earned money as a servant in tea shops before making money playing soccer. Pele biography shows that because of growing up in poverty, Pele could not afford a soccer ball so he would use a sock stuffed with newspaper and tied with a string or a grapefruit to practice his skills. History of Pele shows him joining Bauru Athletic Club juniors located in Bauru, Sao Paolo when he was 14 years old after he was spotted by former Brazilian international Waldemar de Brito in a youth tournament where Pele was the top goalscorer as well as the best player of the tournament. Biography of Pele as a professional soccer player starts in 1956 when Pele's youth soccer coach de Brito got him a tryout with Santos Futebol Clube located in an industrial and port city of Sao Paulo, Brazil. De Brito claimed to Santos sporting directors that 15 year old Pele would become the greatest player in the world, little did he know that it would really turn out that way years later. Pele biography shows him making his debut with Santos on September 7th, 1956 scoring one goal in a 7-1 friendly win against Corinthians. Pele was given the starting position for Santos the following season (1957) and at the age of 16 he would become the top goalscorer in the league. Pele biography shows him winning his first major title with Santos in 1958 as the team won the Campeonato Paulista (Brazilian Premier League) where Pele was also the top goalscorer with record 58 goals. This record has not been broken yet. The following year (1959) Santos lost the Paulista Title only to regain it again the following year (1960) with Pele scoring 33 goals to help his team become Brazilian champions again. Pele biography shows that he scored 47 goals the following season (1961) to help his team retain the Paulista Title and that same year Santos went on to win the Taca Brasil with Pele finishing the tournament as top scorer with 9 goals. In March of 1961 Pele scored a memorable goal against Fluminense at the Maracana. He received the ball at the edge of his penalty box and ran the whole length of the field dribbling past players and than shooting the ball in the back of the net. Pele biography shows that this goal was regarded as "gol de placa" which means "goal worthy of a plaque" and the plaque was commissioned with a dedication for the most beautiful goal in the history of Maracana. Winning Taca Brasil allowed Santos to participate in the Copa Libertadores, the most prestigious club tournament in the Western hemisphere. In 1962 Santos had the most successful season winning Copa Libertadores by beating the defending champions Penarol in the finals. Pele scored 2 goals to secure the first Copa Libertadores title for Santos. He finished the tournament with 4 goals, coming in second best scorer of the competition. Santos defended the Brasilian Championship with Pele scoring 37 goals, Taca Brasil title with Pele scoring four goals in the final against Botafogo and they also won the 1962 Intercontinental Cup against Benfica. Pele biography shows him having one of the best matches in the Intercontinental Cup final against Benfica scoring a hat trick in Lisbon helping Santos beat the defending champions Benfica 5-2. Santos automatically qualified for 1963 Copa Libertadores semi final as defending champions. Pele played a big role in defending Copa Libertadores title helping Santos defeat Boca Juniors in the final match to become the first and only Brazilian team to lift the Copa Libertadores on Argentine soil. Biography of Pele shows him finishing the tournament as second top goalscorer with 5 goals. Santos lost their 1963 Campeonato Paulista (Brazil Premier League) as they came in 3th but went on to win the Rio-Sao Paulo tournament after beating Flamengo 3-0 in the final with Pele contributing 1 goal. Pele biography shows that he would also help Santos retain the Intercontinental Cup and the Taca Brasil this year. In 1964 Santos failed to defend their Copa Libertadores title as they were knocked out of the tournament during the semi final against Independiente. Pele biography shows that he scored 34 goals during the 1964 season to once again help Santos win the Campeonato Paulista (Brazil Premier League) and would go on to successfully defend the Rio Sao Paulo and Taca Brasil for the fourth consecutive season. Biography of Pele with Santos shows that 1965 season was the start of a decline for Santos as they only retained the Campeonato Paulista and Taca Brasil titles but failed to advance past the semi final of Copa Libertadores losing to Penarol, and than failing to retain the Torneo Rio Sao Paulo title. In 1966 Santos and Pele would lose their Taca Brasil title and the Campionato Paulista title. Santos and Pele came back to win the Campionato Paulista for the next three years in a row, 1967, 1968, 1969 but would than lose the title in 1970 and would not win it again until 1973. Pele became less and less a contributing factor to Santos winning titles as their golden years of winning multiple titles came to an end at that time. Important to mention in this Pele biography is that he scored his 1000th goal in all competitions for Santos on November 19th, 1969 in a match against Vasco da Gama when Pele shook the net for O Milésimo (The Thousandth) from the penalty spot at the Maracana stadium. Pele's electrifying skills and his hunger to score goals led to spectacular play which made him a star all around the world. He toured internationally with his team Santos. One important fact that I would like to mention in this Pele biography is that in 1967, Nigerian Civil War was put on a 48 hour ceasefire so that they could watch Pele play an exhibition game in Lagos. Pele biography shows that he played alongside other great players during his time at Santos such are Zito, Pepe and Coutinho that proved to be a deadly front line partnering in many one two plays , attacks and goals. Pele scored an amazing 1087 goals in 1120 matches with Santos. After 17 years with Santos, Pele retired in 1972 but would still suit up occasionally for Santos in official competitive matches. Two years later Pele came out of semi retirement to join New York Cosmos and also bring popularity to the great game of soccer in United States. On his debut for Cosmos on June 15th, 1975 Pele was welcomed by a full capacity crowd in which he also scored a header as the whole stadium chanted his name. On October 1st, 1977 Pele retired after an exhibition match between Cosmos and Santos at Giants Stadium in front of a capacity crowd. This match was televised and followed by millions of people all around the world. He played first half for Cosmos and second half for Santos. The game ended 2-1 in favor of Cosmos with Pele scoring a goal for Cosmos from a direct free kick. After the game he ran around the field with American flag in one hand and Brasilian flag in the other. Soon after he was lifted and carried around the field by his teammates as the capacity crowd sang his name. Pele made his first International appearance for Brazil on July 7th, 1957 in a defeat against Argentina at the Maracana stadium. Biography of Pele shows that he scored his first goal in this first match at 16 years and 9 months old making him the youngest player to score in International soccer. Ten months after signing his first professional contract for Santos, Pele was called up for the Brazilian national first team. After the World Cup was done, many wealthy European clubs such are Juventus, Real Madrid and Manchester United tried to get the young Pele's signature. 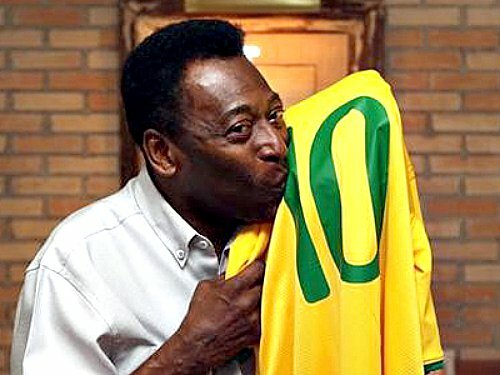 In order to prevent Pele from being transferred out of country Brazil declared Pele as an "official national treasure". His first World Cup match was against USSR in the first round of 1958 World Cup. He was the youngest player ever to play in the World Cup but would brake few more records by the end of the tournament. Pele scored his first and the only goal of the match against Wales in quarterfinals to become the youngest player ever to score a goal during World Cup. He was 17 years and 239 days old. Brazil played France in the semi final where Pele became the youngest player to score a hat trick (3 goals in one match) and become the youngest player to ever play in a World Cup final match. During the final Pele scored 2 more goals with one of them being selected as one of the best goals in the history of World Cup. Pele lobbed the ball over the defender and than followed up with a volley shot that ended in the back of the net. After the match ended and Brazil had became Champions Pele passed out on the field and had to be attended by medical staff. As he recovered and got up joyful tears were clearly visible coming down his cheeks as he was congratulated by his teammates. He finished the tournament tied for second place in most goals scored as he netted 6 goals in 4 matches and was named young player of the tournament. He was also given the Silver Ball as the second best player of the tournament, behind Didi. After scoring a goal in the opening match against Mexico, Pele only played a small part in Brazil winning this 1962 World Cup because he was forced to watch the tournament from the sidelines after picking up an injury in the beginning rounds against Czechoslovakia. With Pele out it was Garrincha who took the leading role and would lead Brazil to their second World Cup title. Pele was at the end of some of the most brutal tackles ever seen in the history of World Cup by the Bulgarian and Portuguese defenders. At this time Pele was regarded as the best player in the world and Brasil was the favorite to become this year World Cup Champion, however they were eliminated after playing only 3 matches in the group stages. Pele scored in the first match against Bulgaria helping Brazil to a victory but would have to miss the second match against Hungary due to an injury as a result of constant and brutal fouling from Bulgarian side. After losing the second match to Hungary, it was a must win to advance situation for Brazil causing the injured Pele to be brought back for the crucial match against Portugal. Pele biography shows that during this match Portuguese defender Joao Morais brutally fouled Pele but was not sent off in what was a sure red card offense. Pele had to continue the match limping because no more substitutions were permitted for Brazil. After this game Pele declared that he would never play in the World Cup again. At first Pele refused to come back and play in the 1970 World Cup after the brutal 1966 World Cup. He than decided that this World Cup would be his farewell as he planned to retire from playing professionally. Pele played some of the best soccer ever seen scoring goals and providing assists to help Brazil advance all the way to the final where they played tough Italian side. Pele scored the first goal in the 4-1 win over Italy to give Brazil their 3th consecutive World Cup Title and also the honor of keeping the famous Jules Rimet Trophy indefinitely. Pele was named player of the tournament. Pele is considered by FIFA the most prolific scorer in soccer history, with 1281 goals in 1363 matches in all competitions. Brazil never lost a match with both Pele and Garrincha on the field and Pele's record with Brazil when he was on the field was 67 wins, 14 draws and 11 losses. Pele biography shows that his last international match was against Yugoslavia in Rio de Janeiro on July 18th, 1971. "I told myself before the game, he's made of skin and bones just like everyone else - but I was wrong". West Germany's 1974 FIFA World Cup winning captain Franz Beckenbauer. "Pelé is the greatest player of all time. He reigned supreme for 20 years. All the others, Diego Maradona, Johan Cruyff, Michel Platini rank beneath him. There's no one to compare with Pelé". Return from "Pele Biography" to "Famous Soccer Players"
Return from "Biography of Pele" to "SoccerManiak Home Page"